Data Storage is where the raw data will be residing at. There are multiple file systems supported by Hadoop and also there are connectors available for data warehouse (DW) and relational databases. HDFS is distributed file system comes out of box with Hadoop framework. It uses TCP/IP layer for communication. An advantage of using HDFS is data awareness between the job tracker and task tracker. Amazon S3 filesystem is targeted at clusters hosted on the Amazon Elastic Compute Cloud (EC2) server-on-demand infrastructure. There is no rack-awareness in this file system, as it is all remote. MapR’s maprfs provides high availability, transactional correct snapshots and higher performance than HDFS. Maprfs is available as part of the MapR distribution. HBase is column oriented, multidimensional spatial database inspired by Google’s BigTable. HBase provides sorted data access by maintaining partitions or regions of data. The underlying storage is HDFS. 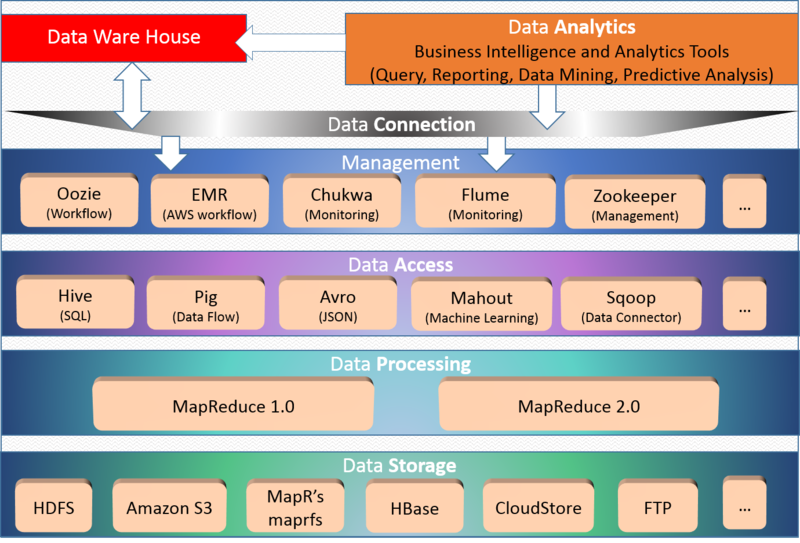 Hive is a data warehouse infrastructure with SQL like querying capabilities on hadoop datasets. The SQL interface makes Hive an attractive choice for developers to quickly validate data, for product managers and for analysts. Pig is a high level data flow platform and execution framework for parallel computation. It uses the scripting language Pig Latin. Pig scripts are automatically converted into MapReduce jobs by the Pig interpreter, so you can analyze the data in a Hadoop cluster even if you aren't familiar with java & MapReduce. Avro is a data serialization system which provides rich data format, container file to store persistent data, remote procedure call. It uses JSON to define data types and protocols, and serializes data in compact binary format. Mahout is a machine learning software having core algorithms as (use and item based) recommendation or batch based collaborative filtering, classification and clustering. The core algorithms are implemented on top of Apache Hadoop using map/reduce paradigm though it can also be used outside hadoop world as math library focused on linear algebra and statistics. Sqoop is designed for efficiently transferring bulk data between apache hadoop and structured datastores such as relational databses. It is a command line interface application supporting incremental loads of a single table or a free form SQL query as well as saved jobs which can be run multiple times to import updates made to a database since the last import. Imports can also be used to populate tables into Hive or HBase. Oozie is a workflow scheduler system to manage Apache Hadoop jobs. It is server based workflow engine, where workflow is a collection of actions like hadoop map/reduce, Pig/Hive/Sqoop jobs arranged in a control dependency DAG (Directed Acyclic Graph). Oozie is scalable, reliable and extensible system. Amazon’s Elastic MapReduce (EMR) provisions Hadoop cluster, running and terminating jobs, and handling data transfer between EC2 and S3 are automated by Elastic MapReduce. Chukwa is an open source data collection system for monitoring large distributed systems. Chukwa is built on top of HDFS and Map/Reduce framework and inherits Hadoop’s scalability and robustness. Chukwa also includes a ﬂexible and powerful toolkit for displaying, monitoring and analyzing results to make the best use of the collected data. ZooKeeper is another Apache Software Foundation’s project which provides open source distributed coordination service, synchronization service and naming registry for large distributed systems. ZooKeeper’s architecture supports high-availability through redundant services It uses hierarchical file system and is fault tolerant, high performing facilitates loose coupling. ZooKeeper is already used by many Apache projects like HDFS, HBase as well as its running in production by Yahoo, FaceBook, Rackspace, etc. 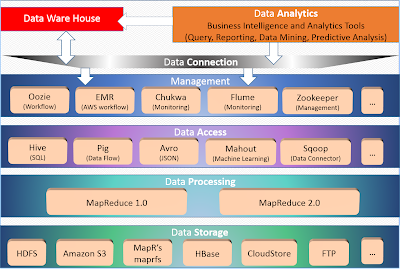 Pentaho – has capability of data integration (kettle), analytics, reporting, visualization and predictive analytics directly from Hadoop nodes. It is available with enterprise support as well as community edition. Storm – is a free and open source distributed, fault tolerant, real time computation system from unbounded streams of data. Splunk – is an enterprise application, can perform real-time and historical search, as well as reporting and statistical analysis. It also provides cloud based flavor Splunk Storm. While setting up the Hadoop ecosystem, you can either do setup on your own or can use third party distributions from the vendors like Amazon, MapR, Cloudera, Hortonworks, etc. Third party distributions might cost you little extra but takes away complexity of maintaining & supporting the system and you can focus on business problem. Nice summary. It would be great if you can go through a case study and demonstrate how this ecosystem works in real world applications. Thanks Deven your kind words and feedback. Your idea is fantastic and I will certainly work towards that. Really useful post about hadoop, i have to know information about hadoop online training institute in india. Great and decent data, a debt of gratitude is in order for sharing your perspectives and thoughts.. keep shakes and refreshing. I appreciate for your great work, This post is a very simple and in-depth concept. Very useful for me and keep it up!